A fine new exhibit at the Legion of Honor started out as "The Spirit of Montmartre" at the Zimmerli Art Museum at Rutgers University. Upon arrival at the Legion, 65 Toulouse-Lautrec works from the collections of the Fine Arts Museums of San Francisco were added and M. Toulouse-Lautrec’s name was added to the title. The balance of the exhibit shifts rather seismically, but it does so without obscuring its original themes. And who would be ungrateful to see such a marvelous massing of Toulouse-Lautrec’s genius? The original show, as represented by its fascinating catalogue, was focused on the radical, avant garde community of artists and writers in Montmartre at the end of the nineteenth century. Rather overshadowed in the art history books by the Impressionists and Post Impressionists, The Spirit of Montmartre makes a convincing case for the importance and influence of these creative people who came together in groups known as The Hydropathes and the Incoherents. Rebelling against the establishment L’Ecole des Beaux-Arts, their irreverent attitude and experimentation with nontraditional media were centered in the cabarets of Montmartre where collaborative works of drama, music, puppet shows, and the shadow theater–a precursor of film–were an integral part of the partying milieu. Illustrated journals, books, and other ephemera are included in this exhibit as well as a collection of puppets and a video re-creation of the shadow theater. Both the content and the forms of these works are seen as important influences on later Dada and Surrealism as well as performance art. The silhouettes of shadow theater (and the flat space of Japanse prints) are integral elements of Toulouse-Lautrec’s posters. "La Goulue," his first poster (1891), uses silhouettes to define the crowd at the Moulin Rouge in the background, sketches in the can-can dancer in the middleground with a wonderfully light, energetic line, and fades the detail of the top-hatted figure in the foreground, reducing it as well to near silhouette simplicity. 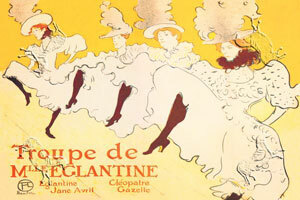 Divon Japponaise, an 1893 poster for another Montmartre establishment, is centered by the figure of Jane Avril, not dancing here, but seated for a performance by the singer Yvette Guilbert, seen (alas, decapitated by the frame) in the background. The flowing curves of Avril’s gown are captured as a contained field of flat black. Her modish, feathered hat creates a pattern of Rorschachian complexity, but the continued use of the flat black of the dress unifies the whole into a pleasing composition. "Troupe de Mille Eglantine" celebrates the cancan line; as in "La Goulue" the raised skirts and ruffled petticoats are suggested with the most economical of lines, while attention is drawn to the high-kicking legs and booted feet with the contrast of dark color. Seen close-up, each dancer’s face is an individualized portrait: the not-so-glamorous look of hard-working nighttime women. In a very different mood, "Aristide Bruant," a singer of satirical songs and laments on the struggles of the poor, is immortalized in Toulouse-Lautrec’s poster for Ambassadeurs. Yet again, the strong sweep of a black cape creates the weight of the composition, with a broad brimmed hat framing the face and the dashing red of a scarf swept around the neckproviding bright contrast at the very center. A silhouetted figure in the background adds a layer of depth. Another delightful piece, "La Loge,"looks up at a woman in a box at the theater, containing the subject in just one quartile of the composition. She’s peering through her opera glasses at the show; her red bow-lips are in sharp contrast to her pale skin and a perky hat suggests a a touch of style. The diagonal curve of the box frontenergizes the print. There’s a lot of material by other artists–some delightful costume designs by Henry Gerbault; unexpected black and white drawings by Pierre Bonnard, known more widely for his richly colored, flower-filled paintings; posters by Jules Grun and Maxime Dethomas. There’s a wondrous panoramic photo-mural of Le Moulin de la Gallette which virtually invites the viewer into the party for a dance. But Toulouse-Lautrec’s artistic brilliance dominates the exhibit. The history is fascinating, but from a purely aesthetic point of view none here can compete with the energy, the wit, the unerring vision and the exuberant creativity that overflow from his works.